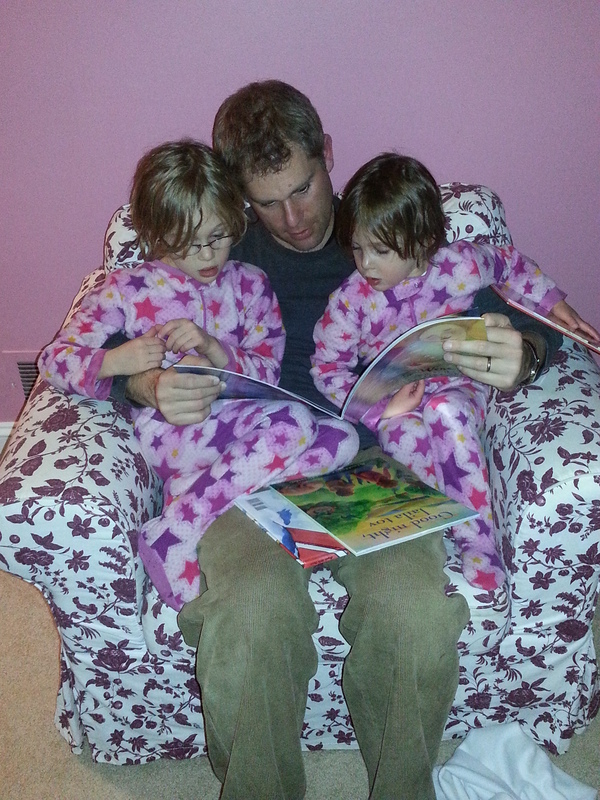 A #DadsRead twitter party last week asked dads to finish this statement: I read with my kids because…. I read with my kids because I can’t imagine not doing it. I am always reading a book, or several, and I love reading with my girls. I’ve read with them almost every day since they were newborns, when they could only stare wide-eyed in the general direction of a book. Our nightly ritual of reading together just before bed is special because we snuggle, get lost in the stories and words together, laugh at characters and events, and sometimes make up our own silly words and stories. Sure, sometimes there are nights when I just want to get them to bed (we’ve all been there! ), and on those nights I try to limit reading time to a single, short book so I’m not going through an exercise that I’m clearly not into (I’m imagine my kids can sense that). Overall, though, story time is special time with one (or both) of my daughters. In the nearly 6 years I’ve been a dad, I’ve read hundreds of little kids’ books – many of them over and over… and over again. It never occurred to me before I became a father how many times my kids would insist I read the same book repeatedly! I’ve found that many of the books – even some of the award-winning ones – are mediocre. Not offensive, but certainly not inspiring to read nightly for weeks or months on end. I also wasn’t prepared for how many kids’ books are just plain awful – bad writing, nonexistent plots, blah graphics. Inevitably, my daughters gravitate to some of these terrible books over and over because they are about…..what else?….Disney princesses! Sigh. But given the alternative – their not wanting to read at all – I’ll take the crappy book every time. Fortunately, some little kids’ books are truly amazing – for the vibrancy of their illustrations, for the way they impart important life lessons without beating you over the head, for their cleverness, for their brilliant use of words. These are the books I have no problem reading night after night and enthusiastically recommend. One and Zero. These uniquely artful books, both by Kathryn Otoshi, use incredibly clever plays on words and numbers to teach kids about standing up to bullies (One) and that every person has value (Zero). Both books are as accessible to kids as they are clever, and resonate with preschoolers, bigger kids, and adults alike. In addition to just enjoying these books’ beauty, I’ve used these books to work on colors, numbers, letters, and reading with my girls, as well as to talk about the embedded ethical lessons. Dragon Stew, by Steve Smallman. What’s not to like about a bunch of bored Vikings – including a girl Viking – getting goofy in pursuit of something to do? This book has terrific rhymes, great illustrations, and a wonderful sense of humor. It’s just plain fun! The Day Louis Got Eaten , by John Fardell. This book is so creative and memorable! It’s formulaic, but in a good way that kids can predict and is fun for grown-ups because there’s something new to catch each time. It practically reads itself; after the first few times through, my girls were reciting every word right along with me. The illustrations are also fantastic – we spend almost as much time talking about the pictures as reading the words. Dragons Love Tacos, by Adam Rubin and Daniel Salmieri. This gem takes grade-school-illustrations to the next level and starts from a hilarious concept – that you should never feed a dragon spicy salsa because it just might cause some unintended consequences. It’s super-fun to read and then talk about, and then reference later when we eat! Red Sled, by Patricia Thomas and Chris Demarest. This peaceful book is super-accessible for beginning readers; it was one of the first books my 5yo started reading to me. An unexpected father/son adventure is told using a two-word rhyming pattern and simple, yet beautiful, illustrations. What’s not to like? Pomelo Begins to Grow, by Ramona Badescu and Benjamin Chaud: At first read, this book seems really strange and seemingly induced by hallucinogens. But then I realized the author is an existential European and somehow it all works. The NY Times Book Review called it an “ad hoc therapy session for those conflicted about getting older.” So read it a few times before you give up on it, because it’s so unusual. Little Fur Family, by Margaret Wise Brown. This 1946 classic is about a little fur boy who explores the wild woods with the support of two very involved and loving parents who encourage his explorations. It somehow captures the essence of exploring the big unknown in a safe way. If you can, get the “fur edition” – my girls love stroking the fur cover while reading about the fur family. Room on the Broom, by Julia Donaldson. This unexpected and fun book has great rhymes and onomatopoeia words. Plus it models the values of kindness and teamwork in overcoming challenges. And now it’s apparently been turned into an animated film. Christmas Tapestry, by Patricia Polacco. This book makes me tear up every time I read it. Having grown up with horror stories of the Holocaust hammered into my brain, this cross-denominational, kid-friendly twist on the typical Holocaust story makes even grown-ups believe that good things really can happen to good people. Hand, Hand, Fingers, Thumb, by Al Perkins. The “other” Dr. Seuss (often confused, at least), Al Perkins is fabulous. This book is all about rhythm and basically is a primer for music lessons, simply by reading it. As a musician, this is a favorite of mine and it has a mesmerizing effect on the young’uns. I also love reading my kids anything by Sandra Boynton. Her books are just plain fun and we find ourselves repeating her memorable rhymes long days later. A few of our household favorites are Barnyard Dance, The Going to Bed Book, and The Belly Button Book. Finally, this list wouldn’t be complete without mentioning the fantastic Dr. Seuss. Cat in the Hat gets a bit old after reading it for the 26th time, but c’mon, no one approaches the great Theodore Geisel, and there are so many amazing stories of his. What books do you enjoy reading with your kids? Let us know, and also share them on twitter with hashtag #DadsRead. This post was written in connection with the #DadsRead campaign, a joint effort by Zoobean and The Good Men Project. #DadsRead promotes the benefits of fathers reading to their children. Check out this infographic to learn more. our older one was really into reading the same books over and over and over… between ages 2-3 we ALWAYS started with a curious george story. Then between 4-5, she became obsessed with Dear Tooth Fairy by alan durant. It got so bad that johny would bargain to read extra books if they did not have to read that one. Your girls are getting to the age that i think they would really enjoy it! thanks for the book suggestion! we’ll check it out.